I'm going to post a picture. Please delete if I've broken any rules! Here's my current shop in the back of my business. [embed=425,349][/embed] Before I post any more I'll wait for feedback. Last summer I purchased a house, 5 acres, and 30x50 shop on which I'm currently working. I hope to turn the day to day operations of my business to my step-son fairly soon and am improving the shop with that in mind:) Thanks for a great group, I've learned a lot lurking here! Looks like a Shop Fox mill you have? Model? Got any pictures of stuff you've made? :Shop Fox 9 49 mill with 2 axis D RO. I added the Z axis. Some coincidence involved but I ended up with a Shop Fox 12x36 lathe with zero hours for bargain price! Sometimes lucky is better than good. LOL. Have done a little more work in the new shop. 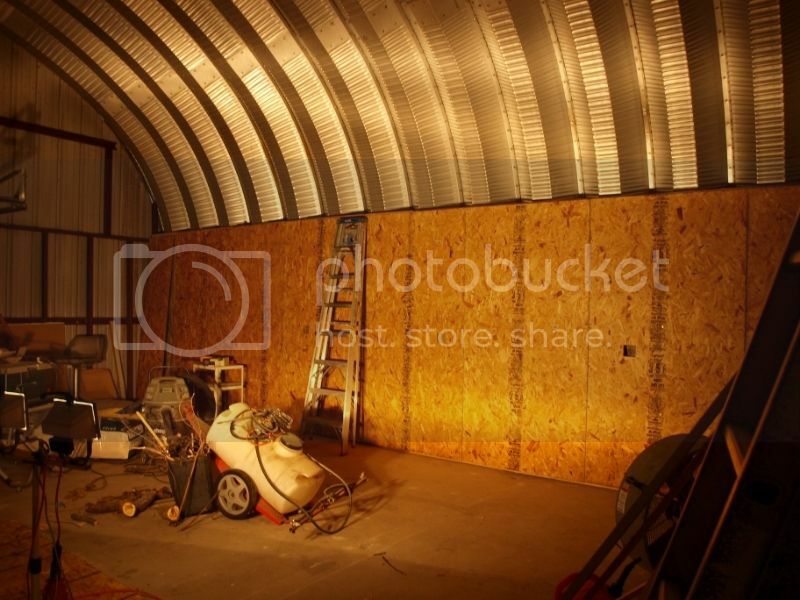 Framed side walls, insulated, hung OSB, and painted. Yesterday I cleaned up some of the mess in preparation for the next installment. Tucked this card file away under a stairwell and belive I can fit two more in that space. I also painted two lateral file cabinets and built storage behind them. They will bracket a 10 or 12ft 30 inch wide bench once it's all complete. I presently deciding whether to try modifying some file cabinets for under bench storage. Slowly making progress. 10 ft bench with lateral files on each end. 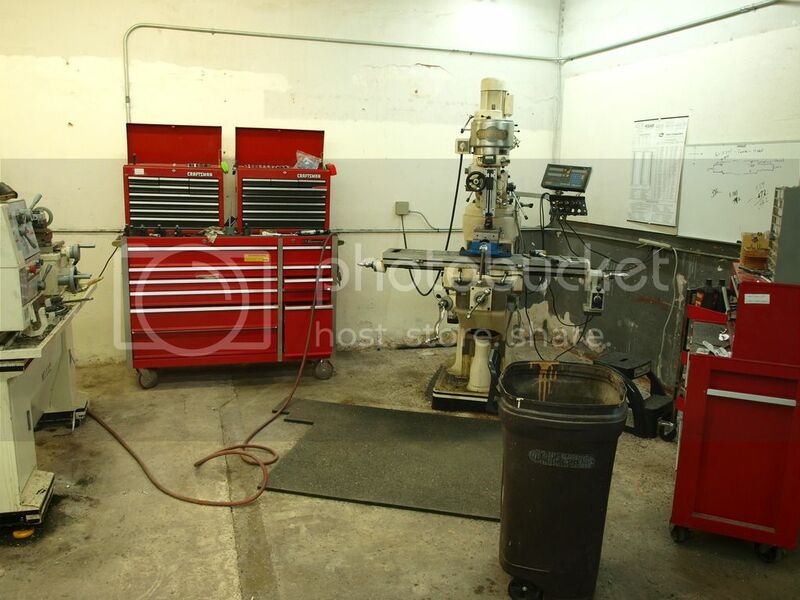 First picture is small parts storage under stairwell in working area of the shop which is 28x30. Second is 10 ft work bench with lateral files on each end for storage, and last is 20x28 room which was already finished I painted and still need to replace drooping ceiling tiles and insulate. The 10' bench is nice but should have something in the center to prevent sagging it's coming along nice though! 2x6 and 20" deep with ladder construction on 16" centers. If there's a problem it will be an easy fix.l Anticipated use for inspection and layout. Thanks for looking. Just an update. I was planning for my step son to take over the buisness next year but fate lead him in a different direction. This Friday I will close the sale with a 3 year employeed and soon be among the unemployed:) Will spend the month of August assisting as needed and in September be able to focus on more important things. LOL. Thanks for listening.! The saga continues. Have been working on electrical and storage and what ever else pops into my mind. Friday I drove to Dallas, TX and put a deposit on 19x120 Summit lathe with 4 inch bore.That throws my floor plan out the window AND means I'll need a jib crane? It must be fun or I wouldn't do this to myself. LOL. That 4" bore is nice I leased a 20" x 17' from Modern Tools years ago on a venture that I got screwed out of it will make life easier chucking materials.